CORE Foods High Protein Meal Replacement Nutrition Bar: Product Review. Anaheim - CA Corey Rennell, Founder of CORE Foods, went on a quest to get to the bottom of nutrition. After traveling around the world with elite athletes, living intimately with twelve tribes, and searching for basic nutritional principles, the "CORE Foods philosophy was born." 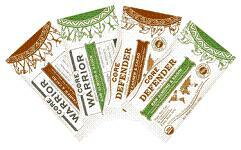 CORE Meal Replacement Bars are intended to be a full meal in a package. Consisting of a fully-balanced ratio of complex carbs, healthy fats, and lean proteins, these meals-on-the-go are intended to provide the human body with a solid 4 hours of energy. Corey provided the "IN" show with two bars for our review. Bearing in mind that this bar IS food; and thus, perishable, we wanted to try it two ways: First, fresh from the fridge; and, second, at room temperature. We were a panel of three; and, each of us came away from this nutrition bar amazed, pleased, and surprised. The consensus for amazement stemmed from the fact that the bar tasted just as good cold as it did being at room temperature. It has been our collective experience that if something states "keep refrigerated" it is usually because one will not like it so much if it hasn't been kept in the cold. I have tried MANY nutrional bars/replacement meal bars/energy bars and CORE Foods' Complete High Protein Meal Replacement Bar hits it out of the ballpark for the following reasons: 1) The energy provided by this bar is not a nervous energy. Instead, it is a constant, foundational energy. 2) The bar IS a meal...NOT a snack; therefore, the body is benefiting from a complete nutritional stand point. And, 3) This bar isn't only good for one body; but, it's good for the world as a whole! CORE Foods is a certified "Golden Rule Trust" Company. This means that CORE Foods donates 100% of their net profits to charity, maintain a zero carbon footprint, and SO much more! Additionally, CORE Foods is a "Certified B Corporation". As a trailblazer, CORE Foods is using their power as a business to solve social and environmental problems. We at the "IN" show give CORE Foods a solid review on their fantastic bars! We strongly encourage you to order some today. Click yourself on over to their site (here) for more information on how - and where - you can get yourself these amazing meals-on-the-go. Before you go, though, be sure to get close and personal with Corey Rennell. He graciously took time from his busy exhibiting schedule to talk with the "IN" show about his company, his mission, and his product. Enjoy! Gus Summers is the Host and Broadcast Producer for The "IN" Show, an entertaining broadcast that covers all things exciting and enlightening. When Gus isn't busy covering current events and interesting people, you'll see him out and about enjoying all that the City of Angels has to offer. For any questions, comments, or program ideas, he can be reached at gus@kclafm.com.